In conjunction with the Social Progress Imperative we have developed the first social progress index at ward level allowing us to understand the social wellbeing of our residents. This pioneering use of data helps decision-makers, businesses, charities and the general public understand how individuals are living and progressing within the borough and who is being left behind. Scorecards consisting of a range of social and environmental indicators divided across 3 broad dimensions of social progress (Basic Human Needs, Foundations of Wellbeing and Opportunity) are available for each of our wards. Download our methodological report (PDF, 1.01MB). Download data and scores for each indicator (CSV, 42KB). 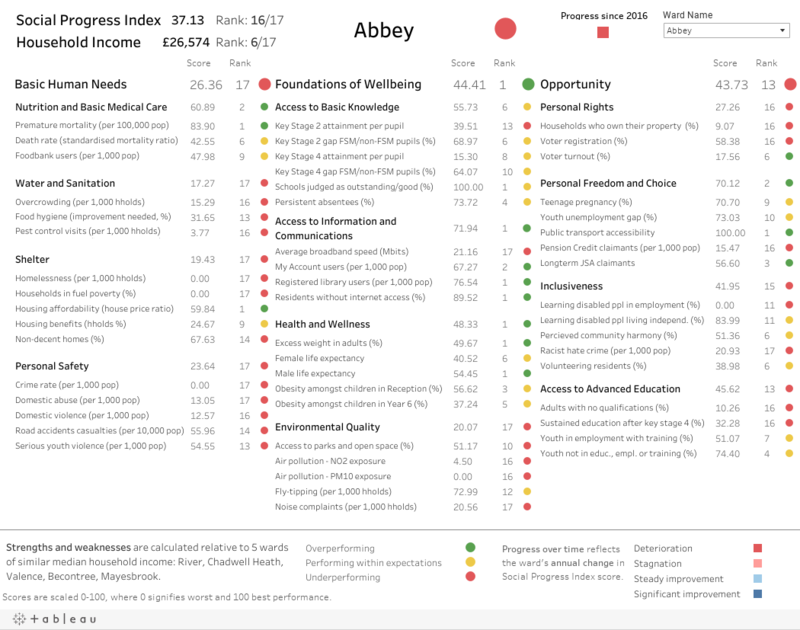 You can also visit our Borough Data Explorer to see a data visualisation for each of the indicators that feature within our 2017 Social Progress Index.